Two Superstars of Alternative Comics Unite! 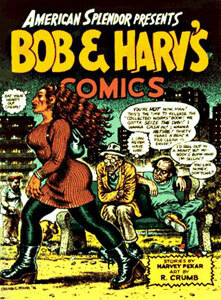 The cranky humor of writer Harvey Pekar-- mostly known to the public from his appearances on the old (NBC) David Letterman show-- is combined with the legendary art of Robert Crumb. The result is something new for both of them, collected here. Pekar's AMERICAN SPLENDOR is hands down the best adult comic book and maybe the best comic book, period, in the U.S. It is full of the adventures of Pekar himself--a genuine working-class intellectual, a clerk in a government hospital who on the side writes about jazz, the comics, and authors whose work deserves renewed attention. He writes and storyboards the stories and recruits professional comics artists to draw them. The most famous of these is his longtime friend, Robert Crumb, dean of the 1960s "underground" comics artists and subject of the extravagantly praised documentary film Crumb (1994). The touchstones for the formal qualities and attitudes of these cartoon-illustrated slices-of-life are the stories of such urban impressionists as Grace Paley and Meyer Liben and the films of the French new wave directors, especially Jean-Luc Godard and Eric Rohmer. Pekar and Crumb don't derive from those artists, however; they are their peers. Copyright© 1996, American Library Association. All rights reserved. Kudos to Sonja for sharing such a delightful and wildly personal account of the moments of her life with the world. Moments. Snippets. A phrase snagged from the air and thrown onto paper. Thoughts. Associations. A peek at the gymnastics of the mind. Through pithy remarks, snappy one-liners, thought provoking collage work and ink blotty scribblyscrawlies, Sonja lets you in. IN. In where? Into her head. Read it more than once to pick up on the subtle threads weaving their way through what seems like voyeuristic chaos. Smart, honest and seemingly unedited, which, very simply stated, is the book's greatest charm. Considered a cult classic (at least that's what it says on the back cover) from the artist who went on to write and draw the highly praised Why I Hate Saturn, THE COWBOY WALLY SHOW consists of four chapters: "The Cowboy Wally Legend" is our introduction to this overblown mockery of a film star; "Sands of Blood" and "The Making of Hamlet" are two crazy attempts at film; and "Cowboy Wally's Late Night Celebrity Showdown" is his final moment of television glory. 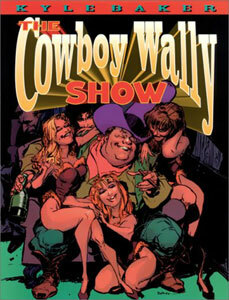 This will appeal to fans of trashy television talk shows. A former criminal needs to tie up just a few loose ends, if he can just keep his new age girlfriend from finding out what's going on... and stay alive. 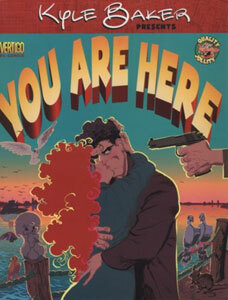 YOU ARE HERE is the story of Noel Coleman, a former denizen of the New York City criminal underworld, and his girlfriend Helen Foster, a cheerful new-ager from rural upstate New York. He's ready to go straight and leave his ugly past behind to be with her. She's blissfully ignorant of who he "really" is. When Noel goes to the city to tie off some loose ends, she surprises him by following. You can imagine the comedy of errors that will ensue... or at least you think you can. But Baker will surprise you. This book is wonderful! I have to say that it is truly one of the finest pieces of literature ever! I recommend buying many copiesof this book, as it makes a fantastic gift item year round. Kyle Baker earns his reputation in this sharp satire of the single's scene and life in the modern world-- finding oneself is hard enough... finding another might be impossible.